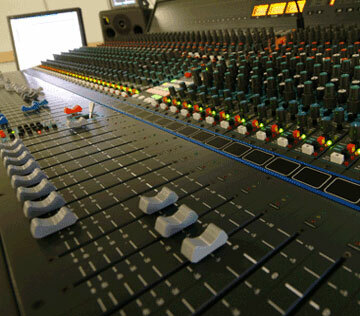 Studio has AMEK Media 51 multiformat mixing console, equipped with Supertrue automation, Virtual Dynamics, Recall, External Machine Control and Visual FX. Studio is equipped with up to 7.1 channel monitoring system and a set of top-level digital effect units and multiband dynamics processors to provide sufficient audio coloration. Wide range of high quality studio microphones allow to record musical instruments and human voice, preserving their original timbre. Computer based 24-bit resolution digital audio workstation with APOGEE AD/DA converters, allows to record on up to 64 separate audio tracks. Also low-resolution video can be stored on audio workstation hard disks. This feature avoids constant rewinding of videotapes and makes audio post production really quick. We have rich bank of sound effects and samples of human voices.